Here I have for sale 4 lasers and 2 Lex led Trilex. 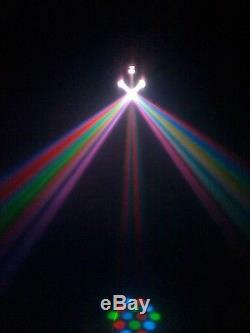 I cannot get the pics of the lasers online but if you send me you mobile number I can send them to you. Here is a list of what is included in the sale. 1/ 2 x Lex Trilights. 2/ 1x Echo Phoenix multi colour laser with Ilda output so you can connect to a computer for even more patterns. 3/ 1 x Chauvet Storm. Blue, red, and green star cluster with remote control. 4/ 1 X Equinox Kamikaze, Green. 5/ 1 x Kam red and green star cluster. All lights are good to very good condition and are DMX compatible. Some are in boxes or cases. Will post but would rather not as I cannot except any damage caused while in transit. TO EVERYONE THAT HAS ASKED, YES I WILL SPLIT BUT PLEASE MAKE ME AN OFFER. 300.00 will take it. The item "Disco lasers and led lights" is in sale since Thursday, May 3, 2018. This item is in the category "Sound & Vision\Performance & DJ Equipment\Stage Lighting & Effects\Stage Lighting Systems & Kits". The seller is "roywillis1962" and is located in King's Lynn.